In his piece Arends showed that Russian small caps were down 78% as of the beginning of March from the all-time highs. Since then, they’ve dropped another 40%. That stings. But in the grand scheme of things that only drops the cumulative total loss to 87% in total. As the numbers approach zero (hopefully the stock market of the 8th largest economy in the world doesn’t make it that far) you need a much bigger drop to add to the total loss. So a 40% loss only added another 10% or so to the bottom line since 2007. To go from an 80% loss to a 90% loss requires another 50% in losses. Unfortunately, when trying to catch a falling knife, timing can be everything. Which is why it probably makes sense for most people to either stay away from these types of speculative investments or dollar cost average over time with an established time horizon measuring many, many years. When price becomes the determinant rather than value, one of the main considerations is not to get into losses. And each of us have a different level of losses we can take. Suppose we have 4 different investors purchasing the same stock that was originally at $1.00. The difference between them is that, each of them got invested at $1, $0.75, $0.50, $0.25. On first examination, it is definitely better to sell first and buy back at $0.50, if you feel the stock ‘can get cheaper’ at $0.80. The problem is that at $0.80, the stock still can get cheaper. If it eventually hits $0.25 before going up, Investor A would have held on to a paper loss of 75%, but Investor B is not too shabby, losing 66.7%. Investor C who possibly think he is safest from this carnage, would have lose less, only 50%. I guess Investor D is the smartest person in the room. 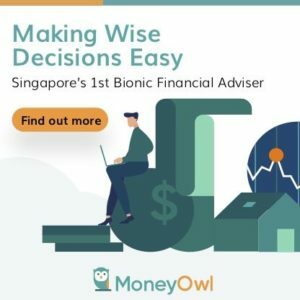 If your ability to make sensible decision requires you to keep your head, and to keep your head, you can only suffer less than 40% losses, Investor A, B and C would all end up selling lower. 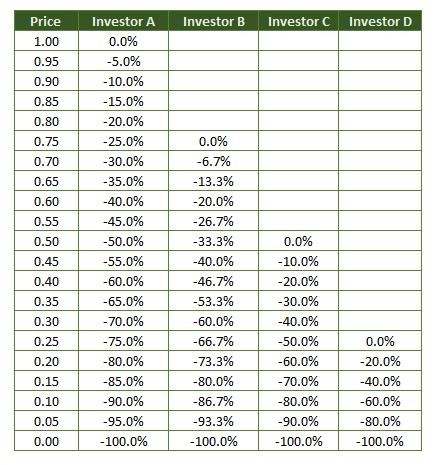 If you take a look at the first negative after 0.0%, that shows the ‘step down’ for each investor. It gets bigger and bigger from 5% to 6.7% to 10% to 20% for the SAME stock price movement. So if the share price fall from $0.25 to $0.20, Investor A won’t feel much difference, Investor C and D would feel more. Its not as easy as it seems and the more important thing is for the stock to turn around. If it goes back up to $1.00, then all will be happy. However if it stays at $0.10 for long time then its not fun for all. Waiting for a market correction. What is your action plan? : Stock market corrections can feel frustrating to wait for but they will come around. Focus on your plan when it does. Distress Stock Buying. Your favorite stock plunges. What is your plan? : Your favourite stock plunges, when do you buy? How do you know that is the right price to buy? Preparing for the Recession: Stocks and Asset class setup recommended by David Rosenberg that an investor can divert into to prepare for a recession. Hmm, there’s where a bit of TA knowledge will help. Buy at prices where there’s a higher chance of rebounding, buy at subsequent support levels thereafter. The best kind of TA branch most suited for investors are divergence type i.e price falls with lower macd, lower vol etc. The worst match will be momentum kind of TA. That being said, u can’t just average down till Kingdom come. Your portfolio allocation will go haywire. TA will help a lot if you are well verse at it. but the same can be said if your fundamental analysis is damn tong kong. with all things its a competency gauge. whether you are a novice or master makes much of a difference. It is indeed always very difficult to know when a stock has reached the bottom and is ready to bounce back. Sometimes it can be for reasons that have nothing to do with fundamentals or TA and this adds to the feeling you are being played by bigger boys. Symmetrically it is always difficult to know when a stock reached the top. I am sure we all had had an experience of selling too early a stock and virtually losing money. I had many of these but I will always remember my experience with buying stocks from Archos in the mid 2000’s. Archos is a French company that was making mp3 players and was ahead of its time with very large capacity players (40-60 Gb) in 2003-2004. I bought 6,000 stocks at 1.5 euros while they were at the bottom of the wave and sold at 3 euros 1 year later making a whooping 9,000 euros capital gain. Very happy with it. Until few months later… when I realized the stock price had jumped to a highest of 65 euros and was stabilizing at around 30 euros. That could have made a difference. Virtually I lost at least 200,000 euros. I remember Archos , probably know it a little better since I was rather poor (still not rich) that they were the first ones that come up with cheap android devices. Thinking back I think I was considering because its an Ang mo company. But this was before probably when they start letting every one know about their music products including Singaporean. That’s a crazy thought .u lost 200k! I always lament one of my arsenal of investing lessons was having only 1.6k in straco at 17 cents. Putting too much when u did little homework is bad, putting too little when u do a lot of work is also bad. Technically the correct answer for me is, if there are no fundamental changes in the business when the prices plunge, pick more up! Of course, you will need balls of steel.